One of the best story lines, or perhaps most excruciatingly entertaining, throughout much of Game of Thrones has been the unrequited love of Ser Jorah Mormont for Daenerys Targaryen. He’s been basically obsessed with her for pretty much as long as we’ve known his satisfyingly rhyming name. She, on the other hand, hasn’t quite reciprocated his feelings with the same intensity. Instead, she’s kept him on her side because he’s a good fighter, a wise advisor (mostly) and loyal to the bitter end. Outside of Game of Thrones, it’s always enjoyable to see the actors getting along so well too. Despite her insisting he knew nothing, Jon Snow (Kit Harington) ended up marrying Ygritte (Rose Leslie) IRL, and who can forget Emilia Clarke and Jason Momoa getting drunk and being all kinds of friend goals together. 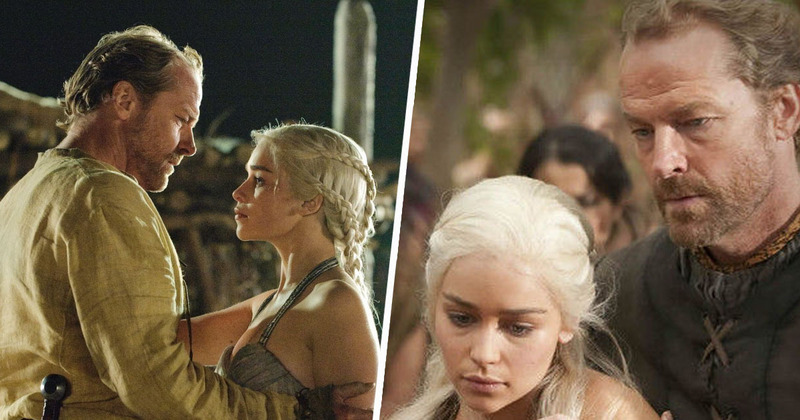 However, some fans think they’ve noticed Emilia Clarke friend-zoning Ser Jorah, aka Iain Glen, in real life too, as they appeared in interviews looking back at their time on the show. As Iain talks to the camera about his co-star Emilia, he couldn’t really be more serious, saying ‘the most beautiful thing about Emilia is she has no idea how good she is, she genuinely has no idea’. She still has no idea, she’s almost sort of vulnerable, which gives this part of her… part of her great gift. It’s a sincere tribute to his fellow GoT star, and you can tell Iain is being really honest in his admiration for his co-star’s acting abilities. 😂😂😂😂 Bruh, the way she said “pal” and “buddy”… she put him in the Friend Zone Hall of Fame. 😭😭 I’m hurt for her. It might be best for Ser Jorah not to get too close to Daenerys anyway, as some people are predicting the return of a certain Khal. Does the ‘he’ refer to Khal Drogo? Is Dany about to reveal she’s pregnant after her liason with Jon Snow? Hopefully there’ll finally be some answers tonight (April 15)! The final season of Game of Thrones will begin in the US on HBO on April 14, and Sky Atlantic early morning April 15 in the UK.